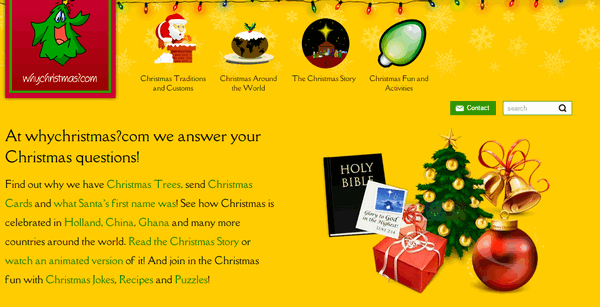 If you have kids or grandkids, or if you still believe in Santa Claus, like I do, then you’ll want to visit this site on Christmas Eve. 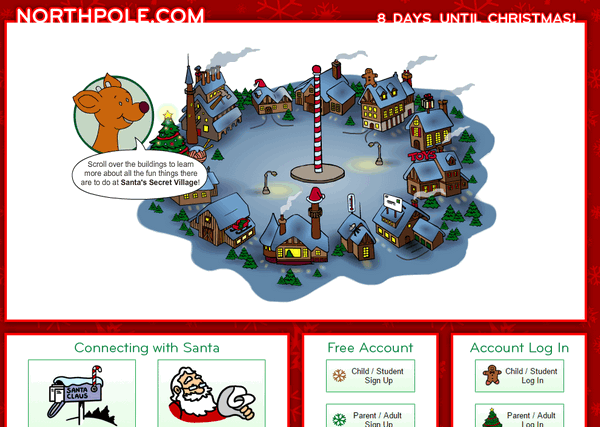 The site opens with a panoramic view of Santa’s Secret Village?, the fanciful home of Santa, his elves, and reindeer. Visitors click on different ‘buildings’ to enter, leading to a variety of activities or stories. 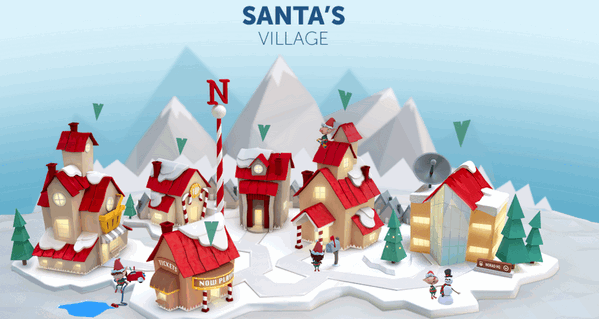 Buildings include Santa’s Mailroom, Santa’s Workshop, Gift Shop, Craft Cottage, Elf Clubhouse, Santa’s Reindeer Barn, Santa’s Den, Mrs. Claus’ Kitchen, Northpole Weather Station, Elf Pal Academy, and Toy Shop. There’s a lot of innocence and naiveté in our first collaborative effort. Looking back, it looks so simple and out-of-date. And whenever we revisit our first Web site, it brings tears and smiles. It hard seems 18 years since we built our first Web site. I just wanted to let you both know that we (all of us who depend on you both for help and guidance) do appreciate you and just want to wish y’all a very Merry Christmas and a wonderful and prosperous New Year. Thank you! You have always guided us and taken care of us from your first site built, your stationary, all the daily “Tips and Tricks “and your Direct Computer Care. We count on you both to keep us up to date and take care of us and you always have. I wish you a Merry Christmas and a very happy & prosperous New Year! I also thank you for all you do for us. It’s not easy in this world we live in today, but you make it easier for us! I totally agree with the comments shared by Damie (above). I can’t believe it’s been 18 years since you launched your website. Personally I don’t remember when I came across it, but it was shortly after you started it. You will recall, TC, that on a few occasions I had mentioned to you how I miss those “acpressions”……..they were wonderful! And I am STILL using stationary from your site that I saved years ago!!! Still love to embellish my notes & emails. Thank you so much for all of these……I bet there are many other members who do and who feel the same way!! I have recommended your site to many friends and I will approach some senior centres, where computer courses are given, and suggest they take note of your site and become members as well. We have learnt so much from your newsletters, and the computer care service you are offering is both a relief and very affordable. It seems inadequate to just say “THANKS”, but it comes from the hearts of many!! And in so doing, I will now go and make a donation, and wish you & yours an extremely happy holiday season and a very healthy 2018!!!!!! 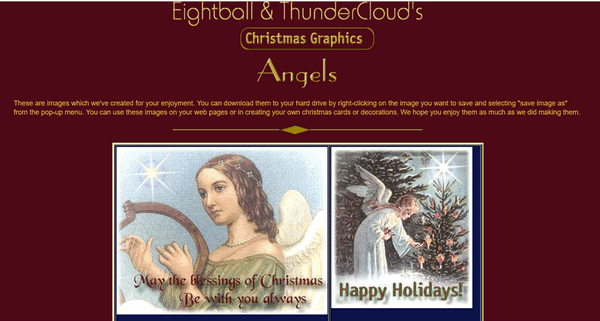 Absolutely love your 3 Christmas Sites…..still working thru them …. just wanted to thank you & to wish both of you all the Joys of the Season . I am a long-standing member & have used your services a couple of times (so far!). Have learned so much from your Newsletters & look forward to them each week. Keep up the great work! It is very much appreciated. Merry Christmas from Canada ! Thank you, Margaret. A very merry Christmas to you and your family.